In early May, Wild Tomorrow Fund held an event at Anastasia Photo in New York City featuring guest speaker, Simon Naylor. Simon is the conservation manager at world-renowned Phinda Private Game Reserve in South Africa. Simon was visiting New York City to participate in the Five Borough Bike Tour with a South African travel company and charity dedicated to rhino conservation, The Cycle of Life, who co-hosted the evening event. The evening presentation, followed by a Q&A discussion, aimed to raise awareness of conservation challenges faced on the ground in Southern Africa, including both rhino poaching and habitat loss. In the video below, produced by filmmaker Shelley Smith, you can hear Simon speak from the heart about his many years of experience on the frontline of conservation, working to protect all wildlife at Phinda, and to restore ecosystems. A ten minute abridged version of Simon’s presentation on rhino conservation. Video credit: Filmmaker Shelley Smith. The poaching of rhinos in South Africa has escalated from 13 illegally killed in 2007 to over 7,245 rhinos slaughtered violently for their horns in the past 10 years. In the KwaZulu-Natal province of South Africa where Wild Tomorrow Fund's work is focused and home to Phinda Private Reserve, the 14 rhinos killed in 2008 rose to a shocking 222 killed in the past year. It is the black-market price of rhino horn that drives the poaching of rhinos globally. Rhino horn is currently one of the most expensive commodities in the world, commanding a price higher than that of cocaine or gold. Only 25,000 rhinos remain across the continent of Africa. Guests heard Simon explain the difficult decision to dehorn rhinos at &Beyond’s Phinda Private Game Reserve in 2016, to keep them safe from escalating poaching. "It was a tough decision. The day that we started dehorning, I didn't sleep that night, in fact for days beforehand, wondering if it was the right decision." Although conservationists and park managers would prefer to see rhinos with their horns, it was the right call to make for rhinos in the region. Dehorning, combined with strengthened intelligence and development support for neighboring communities, is proving successful. "Dehorning has been successful for us so far, touch-wood" said Simon. The reserve has lost one rhino since dehorning began. It is possible the poachers did not see the rhino had been dehorned at the time they tracked and killed it. It has now been three years without a rhino poaching death, in a region currently under intense pressure, as reported by BBC news. 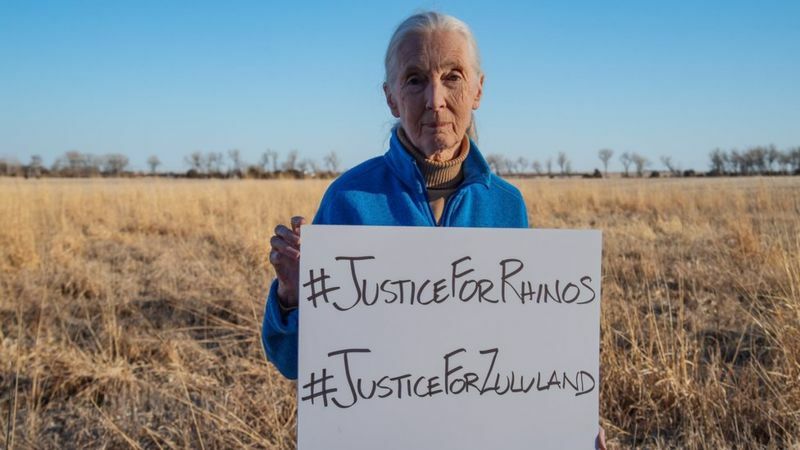 Just two weeks before the talk, Jane Goodall and Sir Richard Branson added their names to an open letter to South Africa's government urging more support for rhino protection. "It is the illegal wildlife trade and the high price paid for rhino horn that puts wild rhinos at terrible risk", says Wild Tomorrow Fund co-founder Wendy Hapgood, "they roam within their patrolled reserves, walking slowly in the wilderness with a target, bulls-eye horn in the middle of their faces. As the world mourns the death of the last male northern white rhino, we must heed Sudan's cry. We must do what we can to protect the remaining rhino species of southern Africa and Asia." Anyone can help by supporting Wild Tomorrow Fund's Wildlife Protection Program. Funds donated for wildlife protection are directed to provide the managers (like Simon Naylor), ecologists and anti-poaching units on the green frontlines of wildlife defense, with urgently needed supplies and equipment. "Poachers are well-funded by criminal syndicates who profit from this violent trade. They enter wildlife reserves by cover of night, armed with automatic weapons, silencers and tranquilizers. Park rangers are not equipped to face this enemy", says Wild Tomorrow Fund Executive Director, John Steward. Illegal poaching harms not only wildlife, but also people. Poaching also steals from communities: South Africa's rural communities rely on wildlife tourism to support their livelihoods. "The illegal killing of wildlife to feed the illegal wildlife trade is stealing from future generations of South Africans", says Wild Tomorrow Fund's John Steward, "I believe in the generosity of concerned global citizens who see the species of rhino as a global heritage species. What would we say to our children if in ten years' time, the only rhinos remaining were in zoos. It is up to us, and to our generation, to make a stand for wildlife." Videographer, Shelley Smith, can be reached at: shelleylucillefilm@gmail.com. We thank her for her time volunteering to film and edit the event video, spreading awareness about rhino poaching and conservation much further than the attendees in New York City. We also sincerely thank Anastasia Gallery for hosting the event space.